We’d love your help. Let us know what’s wrong with this preview of Wicked Lies by Lisa Jackson. For two years, Justice Turnbull has paced his room at Halo Valley Security Hospital, planning to escape. Justice has a mission-one that began with a vicious murder two decades ago. And there are so many others who must be sent back to the hell that spawned them. . .
Laura Adderley didn't plan to get pregnant by her soon-to-be ex-husband, though she'll do anything to protect her baby. But now reporter Harrison Frost is asking questions about the mysterious group of women who live at Siren Song lodge. Harrison hasn't figured out Laura's connection to the story yet. But Justice knows. And he is coming. . .
Then Kill Again. . .
All her life, Laura has been able to sense approaching evil. But that won't stop a psychopath bent on destroying her. Justice has been unleashed, and this time, there will be no place safe to hide. . .
To ask other readers questions about Wicked Lies, please sign up. This is a book I received from goodreads giveaways. 529 pages is overkill for this book. I found the content repetitive and a bit too slow for my liking. The book appears to have a lot going on, but the characters interesting traits wear thin and things become dull. So, there is a killer that escaped with the intent on killing all his relations. There is a woman who is pregnant who can communicate telepathically with the killer. And there is a washed up reporter trying to prove his worth. And of This is a book I received from goodreads giveaways. 529 pages is overkill for this book. I found the content repetitive and a bit too slow for my liking. The book appears to have a lot going on, but the characters interesting traits wear thin and things become dull. So, there is a killer that escaped with the intent on killing all his relations. There is a woman who is pregnant who can communicate telepathically with the killer. And there is a washed up reporter trying to prove his worth. And of course there are a slew of other characters that are in the mix. Being Lisa Jackson, there is a little deception, a little romance, some psychic powers, and a lot of action, filling the pages. I have to admit that I've never read Nancy Bush but the combination of these authors has led to a fast, fun read. The first thing I loved about this book, and the thing I loved the most, is that these two talented authors named their psychotic maniac 'Justice'. While it's true he was out to execute his own sense of justice on the sssssisssterssss, it would be a justice t Being Lisa Jackson, there is a little deception, a little romance, some psychic powers, and a lot of action, filling the pages. I have to admit that I've never read Nancy Bush but the combination of these authors has led to a fast, fun read. The first thing I loved about this book, and the thing I loved the most, is that these two talented authors named their psychotic maniac 'Justice'. While it's true he was out to execute his own sense of justice on the sssssisssterssss, it would be a justice that normal people would call murder and mayhem. His mind did work in amazing ways, though, genius really. And (here's your forshadowing moment) he's not the only one. The sisters he is after live an almost cultish life in "the colony". Well, most of them do. Some have managed to move out into the real world and assimilate. Those are the ones Justice goes after first. All of the sisters are interesting characters in their own rights and each has a special 'gift'. Laura's 'gift' is that Justice can talk to her mind. Ya, that would be the 'gift' I would choose if I had a choice. Laura didn't have a choice and she's stuck with this psycho in her brain. There are at least three mysteries going on at the same time and this is not at all confusing. (seriously) The authors manage to keep it all separate and easy to follow. The only problem I had with the book was the inclusion of the sub-plot involving the teenage brothers. It just seemed contrived to take up space. Luckily their part in the novel is quite small and so it doesn't really detract from the suspense or flow of the story. The romance is truly romance and doesn't spill over into erotica, which is the way I like my romance. Keep the tension up and leave lots to the imagination. We're talking true love here, not just a case of overbearing lust. Made my heart beat a little faster *sigh*. This book was an absolute page turner. These two sisters wrote these characters so well. The way they wrote this villain was so good that I loved him only because he made the book so interesting. But I hated him because he was so sinister. OMG he was so EVIL!! He's the kind of guy that you definitely want to read about but never want to meet in person EVER. Her other character Laura, was such a sweetheart that you instantly fall in love with her. And then (exhaling) you have Harrison, who doesn This book was an absolute page turner. These two sisters wrote these characters so well. The way they wrote this villain was so good that I loved him only because he made the book so interesting. But I hated him because he was so sinister. OMG he was so EVIL!! He's the kind of guy that you definitely want to read about but never want to meet in person EVER. Her other character Laura, was such a sweetheart that you instantly fall in love with her. And then (exhaling) you have Harrison, who doesn't love a reformed player? (Well at least in my opinion.) This book has a great variety of characters that made this book a great suspense. Imagine you going on with your life and this random evil person wants to come and kill you? He wants you dead. So what can you possibly do to make sure you survive this psychopaths wrath? That's where Harrison comes in and tries to save the day. Harrison being the player he was, couldn't believe it when he started having certain feelings he never experienced before. And with these feelings involved, he made it HIS business to make sure that Justice never touched Laura or anyone else again. Overall I like the book even though I believe the editor didn’t do their job, many inconsistencies in the book were glaringly obvious and, to me, slightly annoying. Things like the ex-husband owning a Porsche but later in the book it’s a Corvette, the characters visiting the same scene within 6 hours doing the same thing they just did, these are things that would naturally occur with two authors writing but the editor should have caught these things and fixed them. The primary characters were wh Overall I like the book even though I believe the editor didn’t do their job, many inconsistencies in the book were glaringly obvious and, to me, slightly annoying. Things like the ex-husband owning a Porsche but later in the book it’s a Corvette, the characters visiting the same scene within 6 hours doing the same thing they just did, these are things that would naturally occur with two authors writing but the editor should have caught these things and fixed them. The primary characters were what you would expect from any Romantic Suspense book the heroine is emotionally vulnerable yet strong in character until it’s time for her to do something stupid so the hero can come and rescue her, like all women in these types of books. The hero is physically strong yet emotionally vulnerable (except he doesn’t know it yet) and just as predictable in his strong physical attraction to the heroine, he of course gets mad at her, they fight, he realizes he loves her and then jumps to her rescue. I found the secondary characters more interesting than the primaries and the ‘surprises’ were no surprise to me as I had figured them out well in advance. I do have to say that the story was otherwise ok, good premise & being a part of a series (I didn’t know that until I was partway into the book) it leaves room for another book later. All in all I would recommend this book for those that enjoy a predictable Romantic Suspense book that is easy to follow and has some good secondary characters that you can make up your own stories about. I recently chose to read from my ever-growing TBR pile and began Wicked Lies by Lisa Jackson and Nancy Bush. I'm so glad I began with this book. It is filled with suspense, romance and drama. Imagine being raised in all-female (namely sisters and an aunt) and rustic environment and leaving for the big city at age 18. Well, that was the life of Laura "Lorelei" Adderley and now she is dealing with her cheating ex-husband and a deranged killer out to finish what he started years earlier . . . killi I recently chose to read from my ever-growing TBR pile and began Wicked Lies by Lisa Jackson and Nancy Bush. I'm so glad I began with this book. It is filled with suspense, romance and drama. Imagine being raised in all-female (namely sisters and an aunt) and rustic environment and leaving for the big city at age 18. Well, that was the life of Laura "Lorelei" Adderley and now she is dealing with her cheating ex-husband and a deranged killer out to finish what he started years earlier . . . killing all of the women of Siren Song, her family's home. If that's not enough to deal with, Laura must also contend with an unplanned pregnancy and a burgeoning romance with a reporter, Harrison Frost. Yes there's a lot going on in this story (and I didn't even mention everything) but it all makes a weird kind of sense in the end. 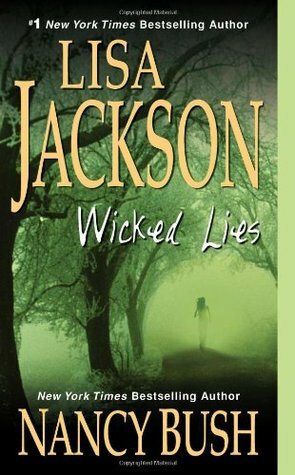 Ms. Jackson and Bush have crafted a delightful romantic suspense tale in Wicked Lies. This isn't a short book but it is definitely worth reading, at least in my opinion. is coming, and amid all this drama there was room for romance. Jackson has a knack for keeping you guessing about the outcome until the end. CD /unabridged/Thriller: There are soooo many things wrong with is book. This review will have spoilers in it and I don't care because I am not recommending it. Nutty cousin escapes the mental hospital and is going after his cloistered cousins from a "cult". He and his one cousin, Lorelei, can communicate. When you hear "Sisssteer", take a shot! And you hear it a lot and my eyes rolled every time. Lorelei is a doormat. Harrison is a cad. But hey, Lorelei is in love with him. Why? Maybe because whe CD /unabridged/Thriller: There are soooo many things wrong with is book. This review will have spoilers in it and I don't care because I am not recommending it. Lorelei is a doormat. Harrison is a cad. But hey, Lorelei is in love with him. Why? Maybe because when she admits that she was pregnant and just had a miscarriage the day before, he's only concerned with her lying to him. He at no time asks if she is okay! She barely knows him and it's none of his business and she didn't lie, she just didn't tell him. Of course being the doormat she is, blames herself and starts to believe that she lied (?). Margaret believes Justice can't get hold of a ladder and doesn't call an ambulance when her niece is stabbed. How many cellphones fall out of someone's grasp? At some point take a hint and tie it to your arm. Lorelei's ex-husband doesn't know that she was from the cult. She never told him. Keeping important information from your husband was probably the root of your divorce. Lorelei is in a small room and is worrying about shooting a gun because it may ricochet. She finally shoots and instead of hitting the person in front of her, hits a lamp. The police are smarter than Harrison. So shouldn't Harrison keep them in the loop more? Justice can smell pregnancy? From miles away? Can he smell when the sisters are having their periods too? So why is nutty cousin killing? I understand he's a nut, but the story never delved into what happened that made him that way. That's right; Margaret refuses to let the kids see a doctor. Maybe poor Justice had a tumor. Harrison doesn't warn his own sister that the person he is keeping at her home has a nut after her. His sister has a child in the house. Get a hotel next time. The lighthouse while old and run down should still hold up. This lighthouse's door was apparently made of Balsa wood instead of oak. The whole supernatural aspect; what is the deal with the little kid. Justice is killed and she's cured? Did anyone believe the story about Mary falling off the cliff? No men are allowed in the hollowed walls of the cult....except the handyman, who not only goes on the property, but brings a cell phone. Wicked Lies is the result of the collaboration between Lisa Jackson and Nancy Bush and is book two in a series about the women of the Colony. The colony is a haven for a group of gifted sisters led by their aunt. The outside community thinks it is a cult, but it’s a safe place for the psychic women to retreat from society. Wicked Lies is a romantic suspense with a slight paranormal tone, that stands alone despite the many references to book one, Wicked Game. While I’m not a huge fan of the romantic thread, the actual story was excellent and kept me turning the pages. The book has a fast pace, unexpected resolutions and crazy people all over. I kept wondering how a reporter was going to protect a woman from a murderous stalker. (Yep, I’m totally biassed.) The more the heroine was threatened, the more I thought “should have fallen for a soldier, cop, PI or bodyguard.” However it did force the story to avoid obvious routes and stick firmly in the suspense category as I worried about the hero and heroine’s capacity to stay alive long enough to reach the end of the story. Would I recommend this book to a friend? : Yep. Nothing is as it seems in this twisted “I’m gonna get you” book. It’s not my top book of the year, but it’s entertaining and well written. I like that I can read Wicked Lies as a stand alone and am not required to read book one in order to enjoy (or understand) the story. If you are looking for crazy stalker/romance story you should check it out. Il s'agit du tome 2 de la série Wicked. L'histoire se situe deux ans après l’incarcération dans un asile psychiatrique de Justice Tunrbull. Malheureusement, celui-ci parvint à s'en échapper et va alors reprendre ce qu'il avait commencé deux ans auparavant. cette fois-ci, sa proie est une infirmière Laura qui a déjà du mal à ne pas se noyer dans les méandres de sa vie à ce moment-là. Dans ce tome on en découvre plus sur Justice et donc sur les raisons de ses actes. De même, au travers de Laura on s Il s'agit du tome 2 de la série Wicked. Dans ce tome on en découvre plus sur Justice et donc sur les raisons de ses actes. De même, au travers de Laura on s'approche un peu plus du chant des sirènes et des secrets de Catherine. Bien qu'il y ait une alternance de 3 points de vue, celui de justice, celui de Frost et celui de Laura, on assiste également à une multiplication de personnages secondaires qui permettent de fixer une intrigue sur plusieurs tomes. Parallèlement à l'intrigue principale avec Justice, Il y a également une intrigue secondaire : une affaire sur laquelle Frost travaillait avant la fuite de Justice et pour laquelle Laura va se porter volontaire au détriment de l'opinion de Frost ! Bien sûr tout cela n'est qu'un prétexte pour favoriser les rapprochements entre nos deux protagonistes. Cependant, bien que la romance soit présente dans ce tome l'intrigue policière prédomine nettement ici. Le dénouement en apparence prévisible connait un retournement final des plus inattendue créant ainsi l'attente du prochain tome avec une certaine impatience chez le lecteur. I really enjoyed this book. It had a lot of suspense, some romance, and some very unexpected things happen. Really great, I did not like the book that came after this one, Born to Die. But Wicked Lies is well worth reading! I am not a ghost story person. I read the first in this series and thought it was ok, this one was better. It had twists and turns and the "ghost" story or mystical component was lesser than the first. IT is a good read, probably even a great read if you love the mystical story! This book was a good thriller. It was a good overall story and each chapter left you anxious for the next. I felt like of the "secrets/surprises" weren't as exciting as the authors revved them up to be. I didnt realize this biook was the second in a series and I thought there was a lot of unanswered questions that may have been answered in book one. It was supposed to be a "supernatural thriller" and I found it to be less than thrilling and only MILDY supernatural. Laura Adderley didn't plan to get pregnant by her soon-to-be ex-husband, though she'll do anything to protect her baby. But now reporter Harrison Frost is asking questions about the mysterious group of women who live at Siren For two years, Justice Turnbull has paced his room at Halo Valley Security Hospital, planning to escape. Justice has a mission-one that began with a vicious murder two decades ago. And there are so many others who must be sent back to the hell that spawned them. . . I enjoyed the storyline. I lt was an easy read, I couldn't put it down (I finished it in two days, staying up late at night to finish it!). My only issue was the romance aspect. I wish we had a bit more time on that front to develop the budding romance between them. I also like to note that when I read this I wasn't aware it was part of a series. That being said I was still able to enjoy it and understand what was happening. I'm excited to go back and read the first one. Published in 2011, Wicked Lies is written by two sisters who both have many novels to their credit. I don't think this is the best of either, but it is a good action story with some suspense and interesting characters. If you are not too critical or demanding this story will keep you well entertained for 530 pages. The book picked up with the ladies of Soren Song but in a more parallel-type sequel rather than the traditional sequel. The characters were built nicely and the existing characters stayed consistent as we were given peaks into where their lives have led them now. Good read for sure. Excellent. Riveting to the end. I enjoyed it tremendously and am reading her other novels as well as Bush. Sherry Arrasmith. Another great book in a great series. Like the first in this series, this story too had several areas where the author seemed to repeat things over and over again. But I did enjoy reading it and it was a very suspenseful read. It was dragged out and too many details that made it unnecessarily long. The story line was good, but just disappointing in how this was written. I've read Lisa Jackson before and I like her writing, but I do not recommend this one written with her sister, Nancy Bush. I couldn't read this book fast enough. What a great thriller. I cannot wait to read the next novel in the series. Would like to find out more about the women from Siren Song. Lisa Jackson is the number-one New York Times bestselling author of more than 85 novels, including Afraid to Die, Tell Me, You Don’t Want to Know, Running Scared, Without Mercy, Malice, and Shiver. She is also the co-author of the Colony Series, co-written with her sister, Nancy Bush. There are over 20 million copies of Lisa Jackson’s books in print in twenty languages. Before she became a nationally bestselling author, Lisa Jackson was a mother struggling to keep food on the table by writing novels, hoping against hope that someone would pay her for them. Today, neck deep in murder, her books appear on The New York Times, the USA Today, and the Publishers Weekly national bestseller lists. With over thirty bestsellers to her name, Lisa Jackson is a master of taking readers to the edge of sanity – and back – in novels that buzz with dangerous secrets and deadly passions. She continues to be fascinated by the minds and motives of both her killers and their pursuers—the personal, the professional and downright twisted. As she builds the puzzle of relationships, actions, clues, lies and personal histories that haunt her protagonists, she must also confront the fear and terror faced by her victims, and the harsh and enduring truth that, in the real world, terror and madness touch far too many lives and families.